Rubbing to edges and corners bumped. Covers creased and stabbed. Emily's life chanages as she joins the movement to win votes for women. In a short period she learns much about life and politics, friendship and courage and has her first romance. 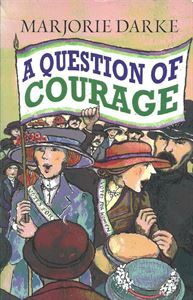 A Question of Courage has been much praised as the best portrayal of a fascinating movements and was shortlisted for many prizes. A really compulsive read.